Aircraft takes off from the UAE without a drop of fuel for flight aimed at raising awareness about clean technologies. A Swiss solar-powered plane has taken off from Abu Dhabi, marking the start of the first attempt to fly around the world without a drop of fuel. The Solar Impulse 2, piloted by Andre Borschberg of Switzerland, took off at 7:12am local time (0412 GMT) on Monday from the UAE's Al-Bateen airport and headed to Muscat, the capital of Oman, where it is expected to land later after the first leg of the journey. The developers say the aim is to create awareness about replacing "old polluting technologies with clean and efficient technologies". Andre Borschberg, Solar Impulse co-founder, was at the controls of the single-seater when it took off from the Al Bateen airport in the United Arab Emirates on Monday morning. The take-off, which was originally scheduled for Saturday but delayed due to high winds, capped 13 years of research and testing by Borschberg and fellow Swiss pilot Bertrand Piccard. They will take turns to fly the plane around the world and switch seats during stopovers. Two hours and 15 minutes into the flight, Borschberg was 13 percent of the way to Muscat and attempting to give media interviews before calling his wife, according to a website monitoring his progress. Shortly before take-off, Borschberg, 63, said on Twitter that the "challenge to come is real for me & the airplane". "This project is a human project, it is a human challenge," Borschberg said on Sunday. Landings are also earmarked for the midwestern US and either southern Europe or North Africa, depending on weather conditions. The longest single leg will see a lone pilot fly non-stop for five days across the Pacific Ocean between Nanjing, China and Hawaii, a distance of 8,500km. Borschberg and Piccard will alternate stints flying the plane, which can hold only one person, with the aircraft able to fly on autopilot during rest breaks. The pilots have undergone intensive training in preparation for the trip, including in yoga and self-hypnosis, allowing them to sleep for periods as short as 20 minutes but awaken feeling refreshed. Should a problem occur while sleeping, the ground staff can wake up the pilot. "We want to share our vision of a clean future," Piccard, 57, who is chairman of Solar Impulse, said of the mission. But Piccard, who hails from a family of scientist-adventurers and who in 1999 became the first person to circumnavigate the globe in a hot air balloon, clung to his belief that clean technology and renewable energy "can achieve the impossible". 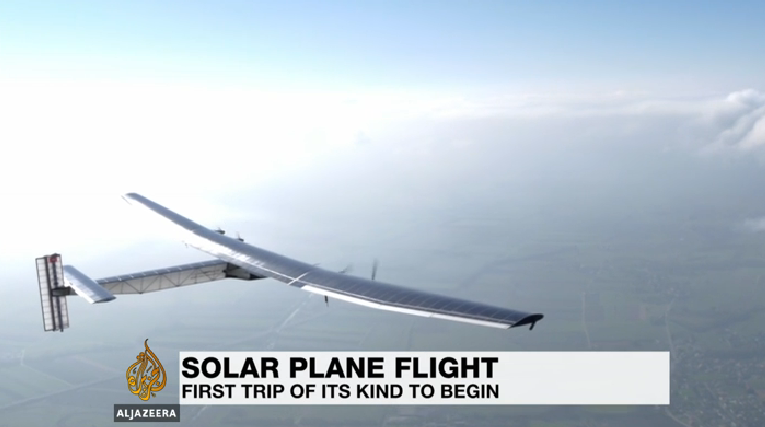 The plane is powered by more than 17,000 solar cells built into wings that, at 236ft, are longer than a jumbo and approaching that of an Airbus A380 superjumbo. The propeller craft has four 17.5 horsepower electric motors with rechargeable lithium batteries. It will travel at 50-100km per hour, with the slower speeds at night to prevent the batteries from draining too quickly. The Si2 is the successor to Solar Impulse, a smaller aircraft that notched up a 26-hour flight in 2010, proving its ability to store enough power in the batteries during the day to keep flying at night. It made its last successful test flight in the UAE on March 2, and mission chiefs reported no problems. A petition was launched at futureisclean.org to campaign in favour of clean energy. Its progress can be monitored via live video streaming at www.solarimpulse.com.